Stable Micro Systems :: Texture Analysis :: What is food texture? Texture refers to those qualities of a food that can be felt with the fingers, tongue, palate, or teeth. Foods have different textures, such as crisp crackers or potato chips, crunchy celery, hard candy, tender steaks, chewy chocolate chip cookies and sticky toffee, to name but a few. Texture is also an index of food quality. The texture of food can change as it is stored, for various reasons. If fruits or vegetables lose water during storage, they wilt or lose their turgor pressure, and a crisp apple becomes unacceptable and leathery on the outside. Bread can become hard and stale on storage and this would be considered a deterioration in its textural quality. Texture is one of the major criteria that consumers use to judge the quality and freshness of foods. Take gummy mashed potatoes, leathery dried apples, and limp celery. We spurn them all, because their texture – the way they feel on the tongue, lips, hard palate, or teeth – is off-putting. When a food produces a physical sensation in the mouth (hard, soft, crisp, moist, dry), the consumer has a basis for determining the food's quality (fresh, stale, tender, ripe). Sometimes, texture is the primary aspect of the food and the main focus of its acceptability. Food texture is assessed by its ability to flow, bend, stretch or break and is often done subconsciously by the consumer. From a sensory perspective, the texture of food is evaluated when it is chewed. The teeth, tongue and jaw exert a force on the food, and how easily it breaks or flows in the mouth determines whether it is perceived as hard, brittle, thick, sticky, and so on. We are incredibly sensitive to texture. Touch is of course the primary sense we use to determine it, but kinesthetics (the sense of movement and position), sound (crunch: good; squeak: bad) and sight are also involved. Sometimes it’s there and we don’t even think about it. Take a creme brûlée for example. It’s a baked custard with a burnt sugar top. Now imagine the creme brûlée without the crunch from the burned sugar. It’s a small detail that makes a significant difference despite the flavour. The term 'food texture' embraces a large number of textural characteristics which are identified and evaluated by the consumer in a well-defined order during mastication. The term mouthfeel is a general term used to describe the textural properties of a food as perceived in the mouth. To people who study food and eating, there are some important variables known as texture and mouthfeel characteristics/properties, and they can make food appealing or not. Whilst some food products are designed to have a ‘quick break’ with a crispy, snapping sound, others, such as gelled or products, have an expected flexibility/elasticity as part of their known textural characteristics.Subtle changes in a food product's formulation can change mouthfeel significantly. Simply taking out such ingredients as sugar, fat, gluten and adding an alternative can cause noticeable alterations in food texture and mouthfeel, making a formerly-good product unacceptable to consumers. Food quality is an important concept, because the foods people choose depend largely on quality. 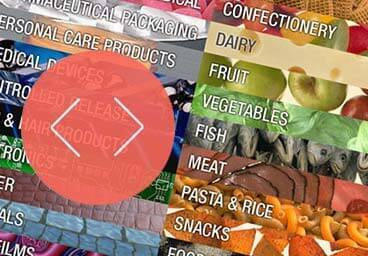 Consumer preference is important to the food manufacturer, who wants to gain as wide a share of the market for the product as possible. Quality is difficult to define precisely, but it refers to the degree of excellence of a food and includes all the characteristics of a food that are significant, and that make the food acceptable. Food texture and the science of food structure is big business. Food manufacturers know all too well that, while the sensory spotlight may often fall on flavour when we’re savouring a mouthful, get the texture wrong and it’s game over – we’ll reject it outright. People take texture for granted until something is wrong with it. A number of the world’s largest food manufacturers are starting to commercialise the texture of their product and an increasing number of product launches are possessing a product claim such as soft, creamy, smooth, crunchy, chewy. 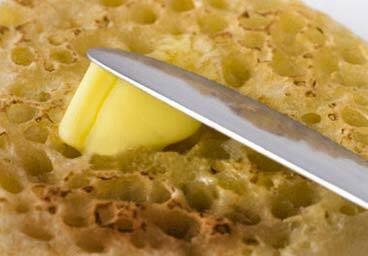 There are two ways brands can innovate with texture to market their products. They can either play up existing or inherent textures in a product, or use texture as a key point of distinction in a new product launch. Extra crunchy, super crispy – texture descriptions have become more elaborate over the last few years along with increasing use of superlatives to convey “the ultimate texture experience”. It’s not just the words that are getting more elaborate – visual texture descriptions are also receiving more prominence on packaging, while the size of texture-evoking words is also increasing. Food texture has become more dominant due to bigger inclusions such as chunks, clusters and nuggets, more innovative shapes have evolved to help achieve extra crunch alongside the idea of providing a multitude of textures all at once, such as chewy, smooth and crunchy. Consumers are drawn to textures for experiences. A fun, new or novel experience is one of the driving reasons shoppers – especially young ones – are attracted to textures in products. Once designed, however, the texture will need to be quantified in order to substantiate its food texture product claims such as 10% more spreadable, 20% crispier, 10% less sticky. Once launched, after it’s desired and bought, any new product will then survive only as long as the manufacturer is able to provide it at consistent quality to meet the consumer’s expectations. Production methods, changes during storage, processing parameters and potential ingredient substitution will all need to be considered as to their contribution to change in finished product texture. 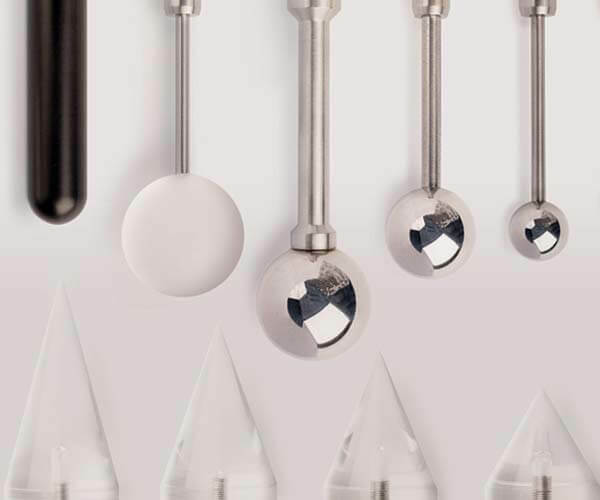 The market is exciting and playful but loyalty is key and quick to change so you’ll want to make sure that the product’ textural quality is optimally measured and monitored to minimise failure. It is therefore essential that manufacturers invest in thorough physical product testing (texture analysis instrumentation) during the earlier stages of development and production to ensure efficiency, optimised recipes and most importantly, consumer satisfaction. More than ever before the food industry is finding itself forced, through outside pressures, to improve constantly its product quality and to maintain that quality at a consistently high level. 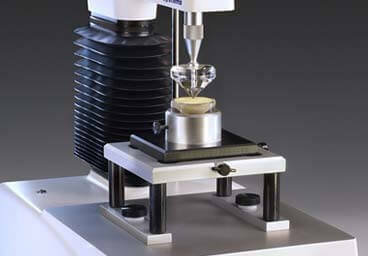 Texture Analyser systems provide the means to measure this by evaluating mechanical and physical properties. How is Food Texture measured? Food texture measurement optimises food quality and customer satisfaction. Measuring texture of foods involves use of physical techniques to objectively evaluate food quality, such as texture analysis. 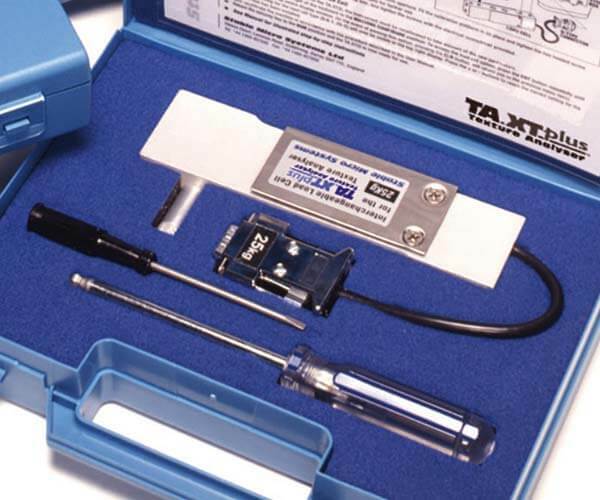 Instrumental evaluation of texture (texture analysis) is performed with a Texture Analyser which involves measuring the response of a food when it is subjected to a force, such as cutting, shearing, chewing, compressing, or stretching - the types of physical assessment the food goes through by the consumer. A vast range of food texture fixtures are available that provide this range of mechanical texture analysis possibilities. Such tests are essential in the food industry for measuring texture, especially for routine quality control of food products. 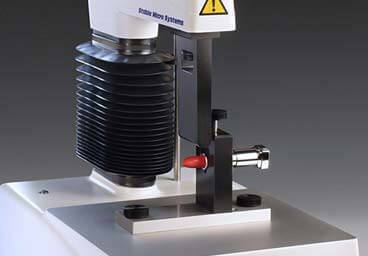 Texture Analysers are used to measure many properties, such as Hardness, Brittleness, Spreadability, Adhesiveness, Tensile Strength, Extensibility, etc, on a vast range of products. The challenge confronting food designers who want to quantify mouthfeel characteristics using an instrumental technique: How to take instrument readings – measurements of forces, distances and other data that look like numbers from a physics experiment – and relate them to something meaningful and relevant to what people actually experience when they taste, chew and swallow a food product? 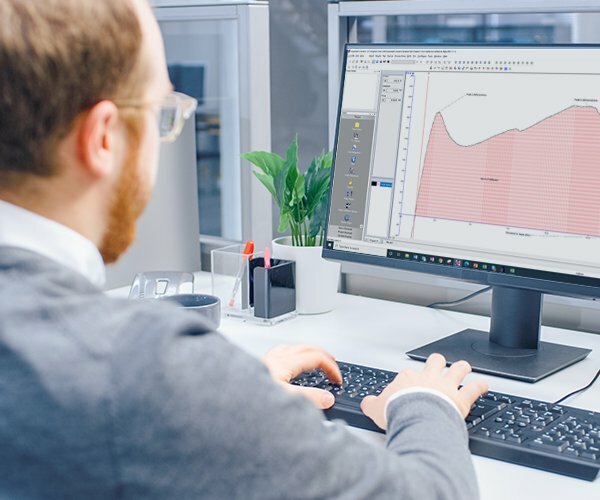 That's where Stable Micro Systems leads the way – we’re happy to help you develop the correct analysis routines for texture testing of your products. What is Food Texture Analysis? It is the science we use to objectively measure the subjective mechanical characteristics of a food product. 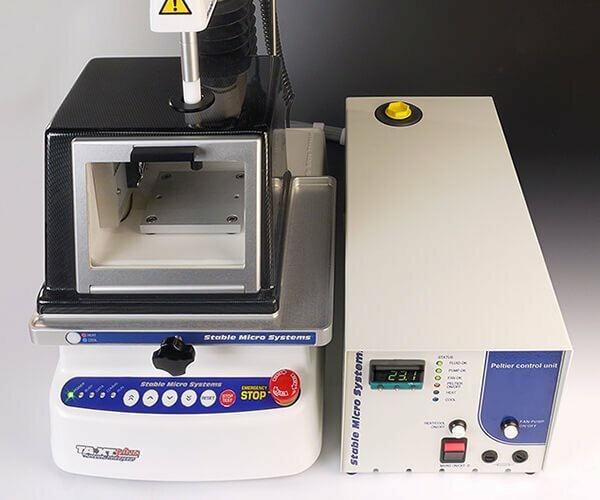 We use Texture Analysers to imitate or create controlled stresses within the sample just as we do when we consume or use a product. The science of texture measurement (instrumental texture analysis) falls across the scientific fields of rheology (the science of material flow) and materials science. Texture Analysis itself is the study of the deformation and flow of a food when under the influence of stress and includes the assessment of raw materials, intermediate components and finished products. From a manufacturer's perspective, food texture analysis could be assessing the functionality of an ingredient within the production process or its effect on the finished product. From a customer's perspective, food texture analysis could be a vital assessment to ensure an anticipated or expected sensory property, quality or functional performance of a food. Sensory tests and verbal descriptor terms are highly useful in understanding product texture/rheology. 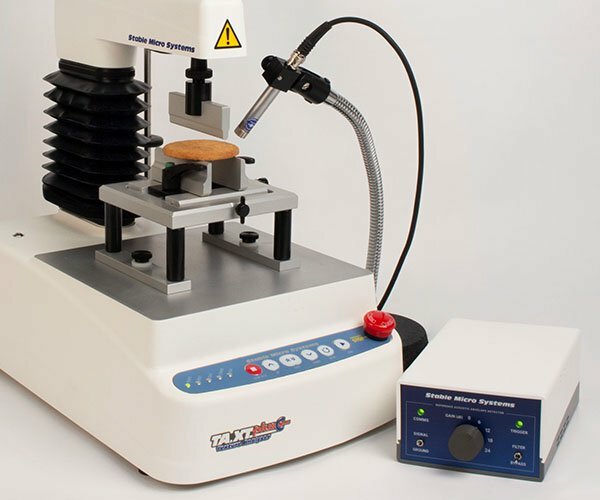 However, sophisticated instruments such as the TA.XTplus Texture Analyser, designed for rheological/textural food measurements, are becoming more and more common, easier to use and better able to provide reliable, meaningful data. "Meaningful" means that the data from these physical instruments correlate very well with the sensory judgments rendered by humans. Consumer evaluation of textural characteristics and mouthfeel can be time-consuming and the data difficult to analyse, so it is extremely useful to replace this method of evaluation by instrumental methods. 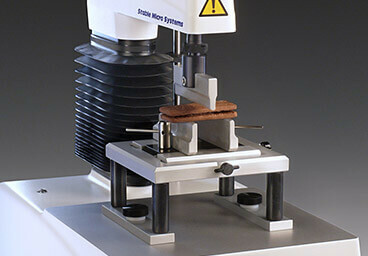 The Texture Analyser uses a range of different probes and fixtures according to your specific application. Whether you require a simple test and data analysis solution or a fully featured software package – we give you the choice. If your product is temperature sensitive, we have a range of temperature monitoring and control options. By attaching peripheral devices you can collect additional measurement parameters during your standard texture analysis test. 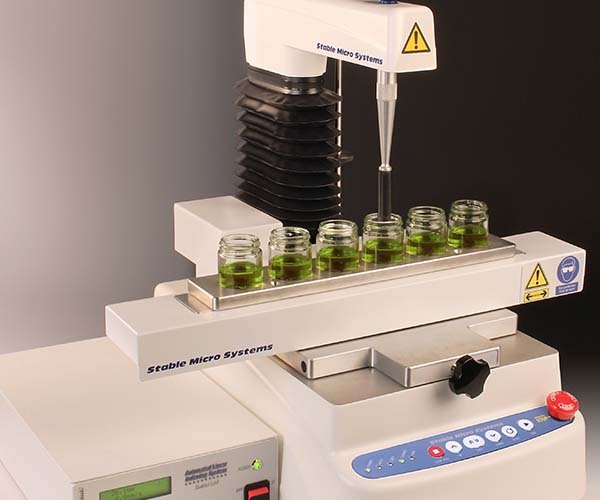 Find out how to increase your sample throughput, walk away time and testing efficiency with several automation options. Our range of Texture Analyser accessories covers requirements for the use, maintenance and protection of your instrument. ... we can provide you with the right equipment and the comprehensive support that you need. 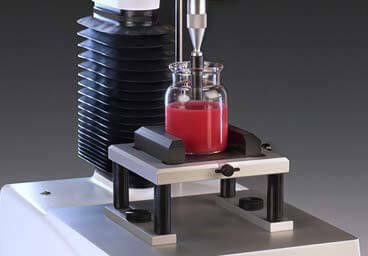 For testing adhesive properties across various sectors, not forgetting paints and polymers.